By almost any ordinary metric, like a marriage or a job, 10 years is a respectable milestone. For a hard-touring and recording band, however, a decade is a sweat-soaked, anecdote-amassing feat. Appropriately, the corresponding anniversary gift is way better something made of tin. Bluesmen don’t come more accomplished than the dudes in MonkeyJunk. But don’t take our word for it. Check out one of the band’s thrilling live gigs this spring and summer as part of #MJ10 Tour. Click here or scroll down for a full tour itinerary (http://monkeyjunkband.com/tour). 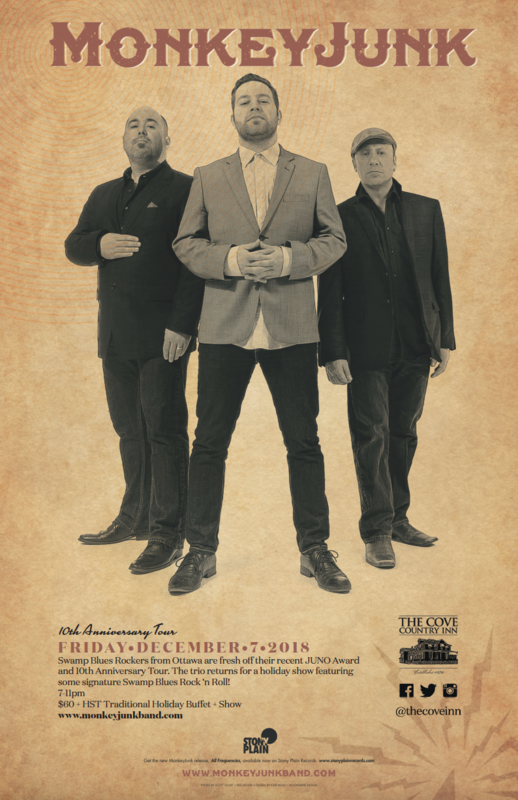 In addition to the above-mentioned pair of Juno Award wins (out of three nominations), MonkeyJunk has also netted an impressive 21 Maple Blues Awards, two Canadian Independent Music Awards, and a Blues Music Award (USA) for Best New Artist, for 2009’s sizzling Tiger In Your Tank. And while that recognition is swell, all band members agree that the real thrill of playing in MonkeyJunk is just that — playing, especially live, where the music’s ecstatic sway on crowds is right there to behold. Tony D, says, “Tempus fugit, as they say when you’re having fun. Has it really been 10 years? It still feels like the 1st time when ever we hit the stage. What I dig about our sound is how it has evolved from our love of the blues, which brought us together in the 1st place, 10 years ago. MonkeyJunk’s 10th Anniversary #MJ10 Tour launches May 3 at Ottawa’s National Arts Centre, wrapping July 28 at Ribfest in Perth, ON. The tour features 31 shows in 25 cities, including a coveted three-night stand at RBC Ottawa Bluesfest opposite Dave Matthews Band, Foo Fighters, Bryan Adams, and Sturgill Simpson. More dates are TBC.